SAN FRANCISCO (Reuters) - A steep downturn in heavyweight Chinese internet stocks and recent weakness in half of the so-called FANG group have some investors worried that a key component of Wall Street's near-decade long rally may be low on fuel. 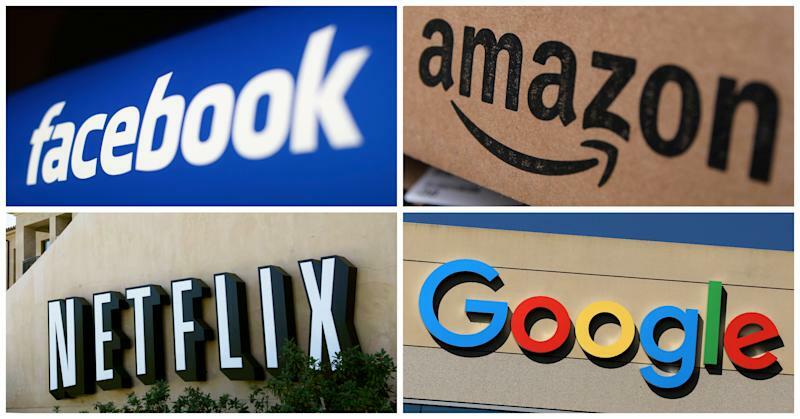 Outstanding gains in Facebook <FB.>, Amazon <AMZN>, Netflix <NFLX> and Alphabet <GOOGL> have underpinned much of the U.S. stock market's rally in recent years, along with the broader tech sector, but the group is widely viewed as overbought and valuations remain expensive. Backed up by strong earnings growth and investor confidence in Silicon Valley's innovation track record, the S&P 500 technology index <.SPLRCT> is up 16 percent in 2018, making tech Wall Street's top performer. But a recent slump in China's own superstar technology stocks, brought into sharper focus after Tencent Holdings <0700.HK> reported its first profit drop in almost 13 years on Wednesday, has increased worries about Wall Street dependence on a handful top-shelf growth companies. With China investors also worried about potential fallout from a trade war between Beijing and Washington, Chinese internet heavyweights Baidu <BIDU.O> and Alibaba <BABA.N> have fallen 11 percent and 7 percent since the end of June, respectively. U.S.-listed shares of Baidu and Alibaba both rose more than 1 percent on Thursday following selling earlier in the week. Amazon recently traded at 87 times expected earnings, its lowest in over a year. But many investors focus on the Internet retailer and cloud infrastructure company's explosive revenue growth. By that measure, Amazon appears expensive, at 3.5 times expected revenue, its highest level ever, according to Thomson Reuters data.